The Tour De Coop Bike Jersey is now available in the on-line store for custom order and purchase. Click HERE to place a order and get pricing information. 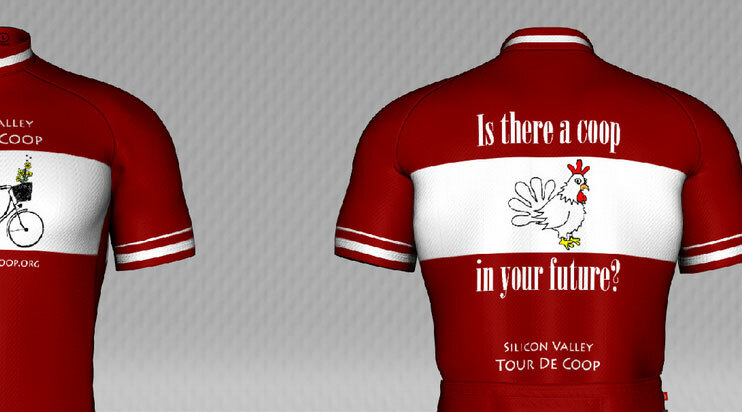 Help promote the SV Tour De Coop year round and join in the clucking coop fun all year with the Silicon Valley Tour De Coop official bike Jersey! Whether you have signed up for this year’s coop event or maybe have participated in one of the previous year’s events, this is a must have for those serious about coops and biking! You can directly order this jersey from them. Back of shirt says Is that a coop in your future?